Giovanni Castrilli Declared his Intention to be a Citizen of the United States at the Lake County, Ohio Court of Common Plea. The Declaration was not dated. He was living at 116 Elm Street, Painesville, Ohio, at the time. Giovanni Castrilli, son of Carmine Castrilli, was born on December 18, 1886, at Sant’Angelo in Grotte, Italy. He immigrated to the United States on May 26, 1902, at age 15. Giovanni was travelling to Ashtabula, Ashtabula County, Ohio, to join his father, Carmine Castrilli. Giovanni re-entered the United States on April 1, 1915, at age 28. He was travelling to Conneaut, Ashtabula County, Ohio. This time, he was joining his brother, Michele Castrilli. 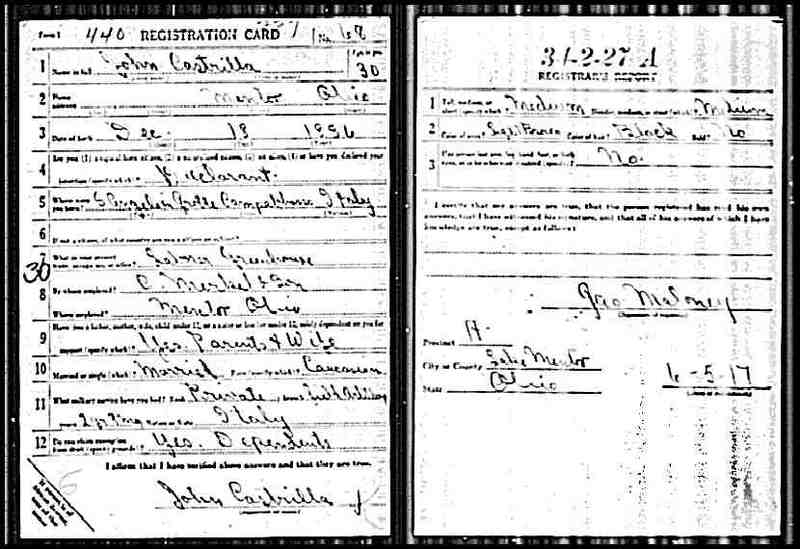 Giovanni registered for the military draft for World War One on June 5, 1917. He was living at Mentor, Lake County, Ohio. He was employed by C. Merkel & Son Greenhouse. The draft registration indicated that Giovanni was married. Mr. Castrilli had two brothers and a sister who also immigrated to the United States. Maria Castrilli Arcaro lived in Wickliffe, Ohio, until her death in 1989. His brother, Felice Castrilli, lived in Ashtabula, Ohio. His brother, Michele Castrilli, lived in Conneaut, Ohio. Giovanni Castrilli was probably related to Painesville Italian Angelo Castrilli (also know as Angelo Castello). I have not found any other record indicating where Giovanni Castrilli may have lived after his Declarstion of his Intention to be a Citizen of the United States.